Father Doug began his duties as pastor of St. Thomas the Apostle on June 1, 2013. Before coming to Lenoir City, Fr. 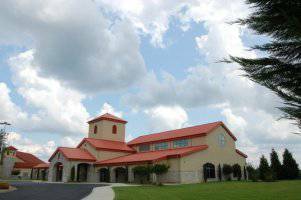 Doug served as associate pastor at St. John Neumann Catholic Church in Farragut, Tennessee. He was ordained a priest at Sacred Heart Cathedral in Knoxville on May 28, 2011-- seven years after converting to the Roman Catholic faith. To contact Fr. Doug, please email him at fatherdougowens@gmail.com. Jim is a former television sportscaster and life-long Catholic who is grateful, after more than 30 years in broadcasting, for the opportunity to actively help the Catholic Church spread the word of Jesus Christ. He joined the Diocese of Knoxville in 2014 as Director of Communications. Born in Pennsylvania and raised in upstate New York, Jim and his wife Mary consider Tennessee their adopted home. They have also lived in Tucson, Arizona; Manchester, New Hampshire and Greenville, South Carolina. They have been parishioners at St. Thomas the Apostle since 2000. To contact Jim, please email him at jwogan@sthomaslc.com. Yadira has a background in business and staffing and holds a Bachelor of Science degree in business administration. She currently works as a human resources manager. Yadira was born in Mexico, moved to the United States when she was 13 and has displayed leadership skills based on her firm Catholic faith. She is a co-chairperson of La Junta Pastoral and also serves in the children’s liturgy. Yadira and her husband are parents of three children and live in Sweetwater, Tennessee. To contact Yadira, please email her at ygonzalez@sthomaslc.com. Maria has a background in finance and holds a Bachelor of Science degree in business with an emphasis in accounting from the University of Tennessee. Maria oversees the business office in a growing family retail business. She has been an active member of St. Thomas the Apostle since 1996, serving as co-chairperson of La Junta Pastoral and attending a mission trip to El Salvador. She and her husband Marco have a beautiful eight-year old daughter. To contact Maria Lupe, please email her at mcornejo@sthomaslc.com. Nancy is a leader in sales, marketing and communications and is currently a vice president of multiple divisions at Provision Center for Proton Therapy in Knoxville. Nancy and her husband, John, and daughter, Haley, have been active parishioners at St. Thomas the Apostle since 2008. Nancy has more than 20 years of leadership in the tourism and economic development industry and has served as sales manager for Hyatt Hotels and as president of the Knoxville Convention & Visitors Bureau. Nancy has been honored as the Associate Member of the Year with the Tennessee Society of Association Executives and is active in Catholic schools, community organizations—including the Farragut/West Knoxville Chamber of Commerce and with the Catholic Church, including a past term with the St. Thomas Parish Pastoral Council. To contact Nancy, please email her at nhoward@sthomaslc.com. Maggie has been a member of St. Thomas the Apostle since 2009. She has been actively involved helping people with mental disorders and also helping children. Maggie is a sophomore in high school and is very concerned about gender equality issues and animal rights. Her hobbies include horseback riding, singing, and working with the St.Thomas Youth Ministry. Maggie has been teaching CCD for four years. To contact Maggie, please email her at mcooney@sthomaslc.com. Roberto has been a parishioner at St. Thomas the Apostle since 1997. In addition to being a leader for St. Thomas Youth Group and Confirmation classes, Roberto is a sacristan, usher, and lector at Masses.He has assisted other ministries when needed. Roberto is also active with Escuela Biblica (Bible School) offered by the St. Thomas Hispanic Ministry. He was born in Mexico and moved to the United States at the age of 14. After spending seven years in California, Roberto and his family moved to Tennessee. He and his wife, Lupe, have been married for fifteen years. He is employed as a supervisor at Monterey Mushrooms. To contact Roberto, please email him at rcortes@sthomaslc.com. Joel has forged a lengthy career in sales and marketing working for AT&T, ScentAir and most recently as a pharmaceutical rep for Lupin. He earned a degree from Pellissippi State in business management. Joel and his family live in Maryville and have been parishioners at St. Thomas for over eight years. He and his wife Amanda have been married for ten years and they have an 8-year old daughter, Jaiden. Joel is a co-president of his daughter’s school PTO. He enjoys hunting, fishing, boating, and spending time with his family and friends. To contact Joel, please email him at jstuder@sthomaslc.com.